Deep Peroneal Nerve is a nerve that is found in anterior compartment of leg and dorsum of the foot. It is corresponding to the posterior interosseous nerve of the forearm. It’s one of the two terminal branches of the common peroneal nerve in the neck of the fibula. It starts on the lateral side of the neck of fibula, under cover of the upper fibres of peroneus longus muscle. It enters the anterior compartment of the leg by piercing the anterior intermuscular septum. It pierces extensor digitorum longus and descends in this compartment together with the anterior tibial artery. In the leg, it follows the anterior tibial artery. The nerve is located lateral to artery in its upper 1/3rd and lower 1/3rd and anterior to artery in the middle 1/3rd. It’s stated that in the middle 1/3rd the nerve hesitates to cross the artery from lateral to medial side, therefore it goes back to the lateral side of the artery. 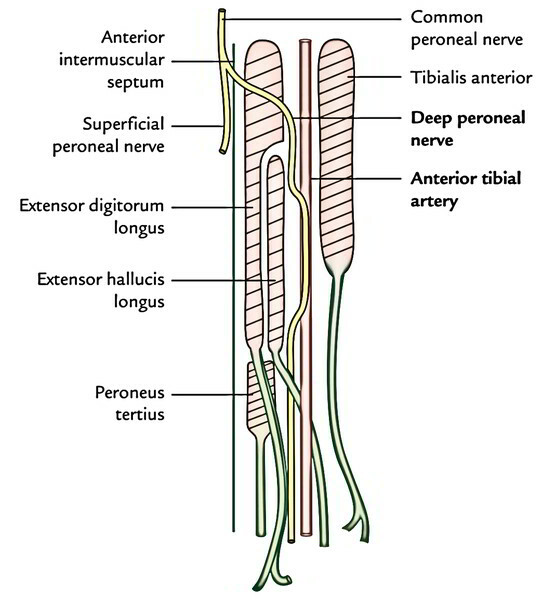 For this reason, deep peroneal nerve is also called nervus hesitans. 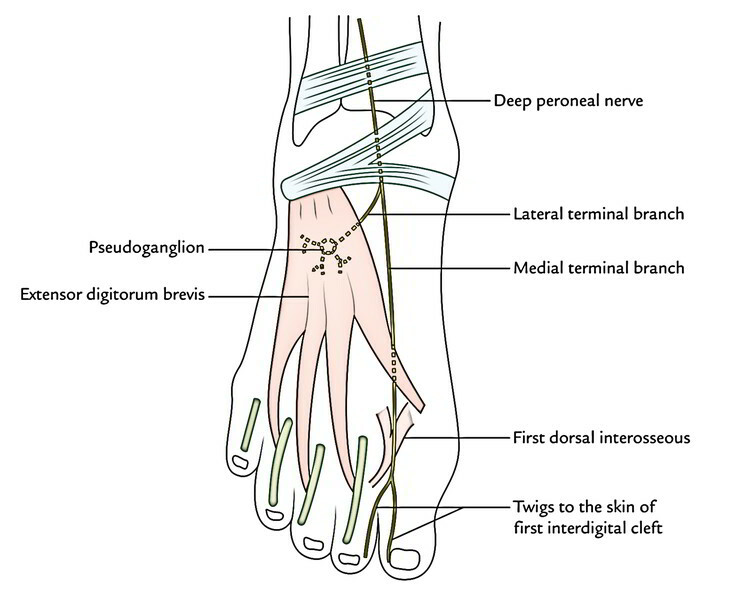 The nerve ends in front of the ankle by breaking up into the medial and lateral terminal branches. The Lateral terminal branch runs laterally and finishes in a pseudoganglion deep to the extensor digitorum brevis. Branches from the pseudoganglion supply the extensor digitorum brevis and tarsal and metatarsal joints on the lateral side of the foot. The medial terminal branch runs forwards and finishes by supplying the skin of the adjacent sides of big and 2nd toes (first interdigital cleft) and the first dorsal interosseous muscle. Muscular branches supply all the 4 muscles of the anterior compartment of the leg, extensor digitorum brevis on the dorsum of the foot and first dorsal interosseous muscle of the sole of the foot. Cutaneous branch supply the skin of the very first interdigital cleft.